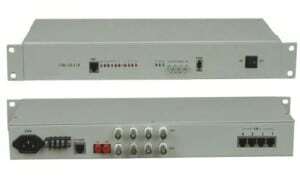 The product consists of the transmitter and the receiver, use advanced uncompressed digital HD video and high-speed digital fiber optic transmission technology, you can easily transmit a variety of resolutions of computers, high-definition video sources, HD DVD / DVR and other equipment output of VGA HD signals over long distances to the remote, and with local VGA loop-through, independent analog audio, anti-interference ability, ensure signal integrity and stability. All-digital, uncompressed, high-definition optical transmission. Compliance with the VGA standard protocol. Automatic identification and configure various display modes. The highest resolution to 1920*[email protected] 60Hz. Single / multi-mode fiber transmission. Built-in ESD protection circuitry, can effectively prevent electrostatic damage. Connect the VGA input signal to the VGA INPUT of transmitter. Connect the audio input signal to the AUDIO IN of transmitter..
Connect the VGA output signal of receiver to the VGA displayer (such as HDTV, etc.). Connect the AUDIO OUT of receiver to the speaker. 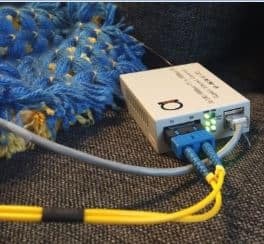 Use the LC interface optic fiber connect the OPT IN and OPT OUT. Connect the transmitter and receiver to the power supply. When the indicator light is normal, the system runs normally. This is a one of most port rich unit in our video extenders range, many ports to connect, however as you can see still can be done in few minutes.